Photo Recovery Center with hard drive recovery and digital photo recovery. Brushset Confidence is just one out of a complete illustration series. There are some more sets with these kind of brushes, all fantasy brushes, abstract and swirly. By the way perfectly done for designers cause all brushes are 1024 pixel large and each sets include the tiny versions as well. Brushset UA Thinking is a beautiful floral pattern, large sized and useful for whatever. The setname is inspired by Teddy Geiger, so the whole update for August is cause I am hooked and captured by his music since a couple of months. During this times brushmaking I had his two cds on rotation, oh and the single too. Three Teddy discs and around 20 new brushsets - all so cute and awesome. I should send him some flowers and a smoochie I think. He deserves it for being such an inspiration on brushwork. Texture #57 is made of scanned textiles. The brushes I have used are upcoming and planned for September or October cause I have to let all the pattern wait for a while. There were so much sets during the last months. Enjoy the new things and send some hugs to your visitors! I hope they'll have some fun with them. So make sure to download all the new brush sets and the textures, and then visit Janita's site Seishido and spread the word about her abundant Photoshop brush resources. And also don't forget to join her newsletter! For more brushes, see our Photoshop Brushes Page. "While Photoshop's Color Balance feature may seem like the right place to go to correct an image's color, your best bets are actually functions that don't even have the words color or balance in their names. "Photoshop expert Deke McClelland will show you how to use Variations, Hue/Saturation, Gradient Map, and Camera Raw. You'll neutralize an image with a widespread color imbalance, increase the saturation of a drab photo, colorize a black-and-white photo, and more." You can find a link to the PDF download at the creativepro.com site. Here's a cool little tip for changing your text without having the Type tool active. Just click on your Type layer (in the Layers palette), then go under the Window menu and choose Character. When the Character palette appears, you can make changes to your type size, color, font, tracking, etc. It freaks you out, doesn't it? Here are the latest Photoshop Plugin Reviews by Jay Nelson, the editor-in-chief of Design Tools Monthly. Neat Image 4.1 ($35$60) is a plug-in for Photoshop that reduces image noise and grain in digital photos and scans. It works well at reducing noise in low-light action photos, as well as in portraits. 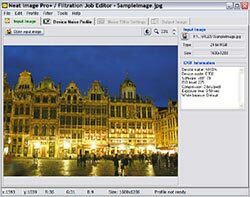 For automated noise removal, you can download noise profiles for many digital cameras, or you can easily create your own. If you set it up as an Action in Photoshop, you can apply it to batches of images automatically. Version 4 can automatically match a profile to an image based on its EXIF data, and is a free upgrade from version 3. Neat Image also intelligently sharpens details as it removes noise. In addition, it can remove film grain from scanned slides and negatives, JPEG artifacts from over-compressed images, and color banding. We recommend it highly. Fred Miranda's Velvia Vision 1.1 ($25) is a plug-in for Photoshop that increases the dynamic range within shadow and highlight detail in an image, expanding its tonal range. It can also be used artistically, to create a mood. For more plugins, see our Photoshop Plugins Page. Ben Long from creativepro.com has posted the final two installments in his excellent Digital Camera Buying Guide. 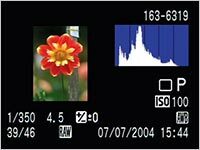 In Digital Camera Buying Guide Part 4 you'll learn how to evaluate camera basics (camera viewfinder and shooting speeds) and bells and whistles (histograms, panorama controls, and more). From the intro: "Buying a Digital Camera, Part FOUR?!" Okay, so this isn't exactly a pocket guide to buying a digital camera, but there are a lot of decisions involved if you want to be happy with your camera choice for years to come. Some of what I'll cover in this installment may seem like silly luxuries. However, once you've spent a little time with them (gotten a little exposure, so to speak), you'll realize that these features can make you a more productive photographer. They're worth considering when you're looking for a new camera. Digital Camera Buying Guide Part 5 is the final installment of Ben Long's guide to selecting the best digital camera. From the intro: "Over the previous four installments of this column, I presented you with a barrage of questions and options related to choosing a digital camera. If you've been following along, you've asked yourself what type of shooting you do, what features you want, what you need in terms of size and weight. After answering all of these questions, you should have narrowed down the field of possible candidates to just a handful of cameras. You're now at the very last stage: the final choice. "The good news is that making the final choice may not be too hard, because, in the end, one question should outweigh all others when selecting a camera: How good are the images it produces? The bad news is that, if you're already favoring a particular camera for its features and design, you may have to nix it and go with a secondary camera that yields better image quality. 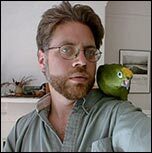 "Image quality is, of course, a subjective topic  one person's hideous noise might be another's beautiful texture. Nevertheless, with a little bit of attention, you can identify problems that might vex you later. Plus, identifying these problems now can help in your image-editing efforts when you begin shooting with the camera." "For those who never heard about it, Relief Shading is a cartography rendering technique where a three dimensional appearance is given to the topography of a map. The execution of this technique is quite complex and it is usually achieved using special map rendering software. "Despite of that, many articles have been written about Relief Shading in Photoshop. These articles are somewhat complex and are usually directed to cartographers and map artists. That’s because they use very precise topological data and any change in the representation can result in misleading cartographic information. "This tutorial will attempt to bring Shaded Relief to the rest of us who sometimes need to create a fancy map for a brochure or a terrain for a video or board game without the need of an exact topological data representation. As a bonus the tutorial ends with a good long list of relief shading resources. Nice touch! For more tutorials see our Photoshop Tutorials Page. The National Association of Photoshop Professionals (NAPP) released a newly updated Adobe Lightroom Learning Center with four video modules by NAPP President and Photoshop guru Scott Kelby, Adobe Technical Resource Manager Terry White, and NAPP Education and Curriculum Developers Dave Cross and Matt Kloskowski, covering the latest public beta release for Windows. NAPP’s Adobe Lightroom Learning Center is the most complete resource for learning Adobe Lightroom, the amazing new workflow tool for professional photographers. It features free video tutorials and an exclusive video interview with Kevin Connor, senior director of product management at Adobe, on how Lightroom fits into the photographer’s workflow. Adobe’s latest Lightroom beta is ready for photographer’s to download, explore and evaluate. Lightroom answers the photographer’s call for a single, intuitive solution that speeds the process of importing, organizing, editing, and showcasing large volumes of images. For more on Lightroom, see our Lightroom Resource Center. Lost Your Cursor? Find It Fast! Photoshop's cursors can be easy to lose onscreen, especially if you're working on a big screen or with the crosshair cursor (meaning you have the Caps Lock key engaged). Well, the next time you're working on an image, and say to yourself, "Hey, where the heck is my cursor?" (but you use a different word in place of "heck"), try this-just hold the Spacebar down for a moment. This temporarily changes your cursor into the Hand tool, whose icon is larger, white, and easy to see. Once it appears, you'll see right where your cursor is, and you can release the Spacebar. Adobe has released the Windows version of Lightroom. You can download this free version from Adobe Labs. Adobe Labs also offers an assortment of instructional videos and tutorials to get you going with Lightroom. If you want to start swapping info with other Windows beta users, visit the Lightroom Beta Windows Discussion. There's already some traffic showing up. There is no update for the Mac beta program at the moment. The current Mac version is Beta 3, released in June. The Windows beta will be labeled Beta 3 but is not perfectly in sync with the current Mac build (no Web Module, Identity Plates or ability to add music to slideshows just yet). There's also plenty of performance optimization left to do (and on the Mac as well, for that matter). The Mac and Windows feature sets will converge before shipping the product. If you have more questions, check out the Lightroom beta FAQ, or see Jeff Schewe's in-depth coverage on PhotoshopNews.com. So download and have fun  because this is a great little app! Twisting Pixels have announced the release of the next version of its special effects applications and plugins for photographers, graphic artists, and imaging enthusiasts. Twisting Pixels products include feature rich visual effect filters that modify and enhance any image to achieve an artistic end result. PixelCreation, PixelPack, PixelPaper, and PixelSampler are built upon an interactive framework that allows the user to draw onscreen to manipulate the images in a dynamic, easy to understand manner. For example, users can interactively create fluffy clouds, romantic moons, or celestial constellations by just by placing them over the image. All products come with a very easy and intuitive preset system that allows the user to create unlimited possibilities and variations and ships with just under 100 presets already created. PixelCreation is a powerhouse of 19 visual and tonal enhancement filters. This suite is designed to allow the user to create fabulously fluffy clouds, incredible moons, spectacular constellations, and celestial skies with easy to use tools. PixelPaper's 15 effects are the most realistic visuals that can be produced using digital medium. The first 7 effects add depth and realism to any image, these include Bend, Crinkle, Crumple, Crunch, Curl, Fold and Wave. The second 8 effects are stylized edges that include Acid, Burn, Border, Corrosion, Edge, GrainStrips, Rip and Watercolor edge. PixelPaper is now the most complete special effect package for depth and realistic stylized edges. PixelPack is a collection of fun filters that add a little flare to any project. The filters include RockCandy, Extrude, Label Maker, Stain, and Texturizer. These filters also include realistic lighting and textures. In partnership with Twisting Pixels we are offering a special discount on any of their fine Photoshop plugins. The coupon code is PSPRT and this will give you 20% off any purchase. If you're color-correcting a number of images that are basically the same (for example, catalog shots or high school yearbook shots, where the lighting and composition are pretty much the same), you may want to apply the same Curve setting to a number of images. Rather than saving the Curve setting and loading it each time, try this tip: Use the Create New Adjustment Layer pop-up menu at the bottom of the Layers palette to create a Curves adjustment layer, and then just drag-and-drop that adjustment layer from your current image to your target image. PHOTO CREDIT: Apollo 11 Images  Earthrise sequence - Earth emerges over lunar horizon. © NASA (National Aeronautics and Space Administration). Scanning credit to Kipp Teague. Latest digital photo news, reviews, books, articles and tutorials. Master Photoshop with Deke McClelland.